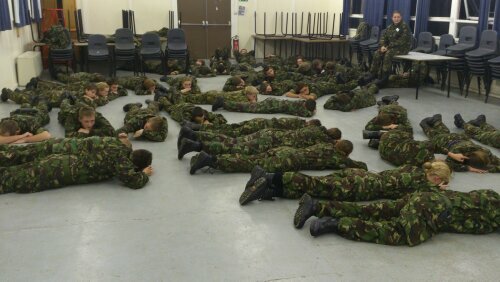 Cadets From Throughout the Wing Practice Playing Dead! Cadets and staff from throughout Cumbria and Lancashire Wing have recently spent the weekend at Halton training centre near Lancaster learning to be the next Junior NCOs. The weekend included a variety of lectures and practical activities including leadership exercises, drill and lecturers covering communication, leadership and the roles of a JNCO. 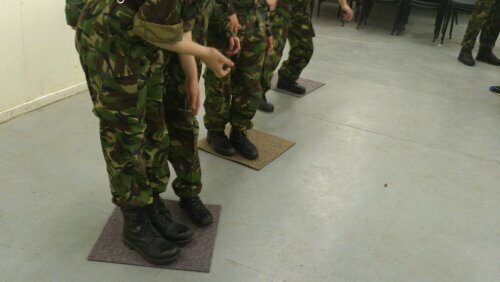 During the various practical activities the Cadets were able to practice the theoretical elements of the course whilst crossing a variety of shark infested pools of custard. Saved from the Shark Infested Custard by Floor Tiles! 967 Squadron sent 5 Cadets on the course and two members of staff to act as assessors and tutors. The Squadron’s Cadets were extremely successful with all passing the course and one achieving the accolade of being rated the highest on course. An excellent result. Well done to all of the Cadets who attended the weekend. It’ll be followed up with a Squadron course early in the new year.